Musicians Allen Shu-cheng Wu and Barry R. Morse in performance. 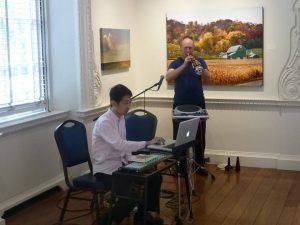 Musicians Allen Shu-cheng Wu, Barry R. Morse, and Jason Finkelman will be featured during a weekend of live, experimental, electro-acoustic music at the Illinois State University Planetarium. Performances will be at 7:30 p.m. Friday, January 20, and at 2 and 7 p.m. Saturday, January 21. The concert, titled “Mercury Rising: A Mid-Winter Celebration of Space and Sound,” will be presented under the Planetarium stars. Wu, Morse, and Finkelman will be joined by award-winning composer John Nichols. Each unique performance will feature soundscape improvisations. The free-form, unrehearsed, real-time sound compositions made from unpredictable combinations of musical sounds and noises are not random, but guided by musical training, intuition, and personal aesthetics. Unlike recorded music, live improvisation is an ephemeral, in-the-moment event, and never to be experienced exactly the same way again. Admission for these special performances is $10 for adults and $5 for guests ages 5-17 and seniors. The Illinois State University Planetarium is located in the Felmley Hall of Science Annex, at the intersection of College Avenue and School Street, in Normal. For more information, call the Planetarium’s Skyline at (309) 438-5007 or visit the Planetarium’s website.